I realised the other day that I don't do nearly as many book related posts as I would like to, and I also want to start doing a bit more than just book hauls. I thought it would make a nice post to share some of the books that I read growing up, as I love looking back on things from my childhood and feeling nostalgic, and also these books were just hidden away in a cupboard so it was a lot of fun re-visiting them! When I was looking back at my old books for this post though I realised most of them were by the same few authors so I guess this will be more of an 'authors I read as a child' post, but I hope you enjoy nonetheless! I'm pretty certain that everyone my age grew up reading at least one Roald Dahl book. Does anyone remember when cereal boxes used to include free copies of books inside? That's where most of my Roald Dahl books came from! The ones I remember reading the most are The Twits, Fantastic Mr Fox and Esio Trot. And of course one of the biggest Roald Dahl story of my childhood has to be Matilda, both the book and the film. I love that story just as much now! When I was younger I think I owned possibly every Jacqueline Wilson book she had released. I was obsessed with her novels! I can't remember specifically which was the first book of hers I read, but my favourites were probably The Diamond Girls, Love Lessons, and Midnight. Again, I'm pretty certain that everyone I know read all of her books as a child! I couldn't not include Harry Potter in this list! I was too young to read it myself when the first book was released in 1997, but I remember my mum reading a chapter a night to me and my sister, and it wouldn't surprise me if it was the first proper book I read for myself. From the fifth book onwards, I was one of those people rushing to asda the second they were published to get myself a copy, and my first editions of the last three books are some of favourite possessions. The Harry Potter novels are what began my love for reading and play a huge part in what inspired me to pursue a career in writing. I'll be forever grateful to J K Rowling and the world she created for us all. When I got a bit older and reached my early teens the author I remember reading the most was Sarra Manning. Again I think I owned every single one of her books. I started off reading the 'diary of a crush' series and quickly ended up purchasing all of the other books she'd written. They were mostly teenage romance books and I remember feeling really grown up when reading them. I think it was around this time that I started to collect books quicker than I read them! There were many other stand alone books that I read when I was younger as well, but these are the authors who I seemed to read the most. I really enjoyed looking back at my old books for this post, I think I'm going to aim to do some more nostalgic type posts in the future! What books did you read when you were younger? The Harry Potter books are my favorite books ever! I remember when I read them for the first time when they came out, I was so impressed with this magical world and JK Rowling is the best! I loved Roald Dahl! I remember reading James and the Giant Peach a lot. I read A TON of R.L. Stein, too, even though I was a huge coward lol I loved the Babysitter's Club and the Sweet Valley series as well! Reading Harry Potter was one of my favorite things to do growing up (still is, duh!) I just wouldn't stop. I even got caught reading it in church one time haha! Harry Potter was my everything when I was younger (although let's be real nothing's changed I still love it). I remember when the final book was released, everyone in my entire school was reading it all day every day! Jacqueline Wilson was my absolute fave! I still have all her books now! I can't throw them out, tbh I wanna give them all another read even tho I'm 20, but they're just so good! I love reading too, books are just the best right? 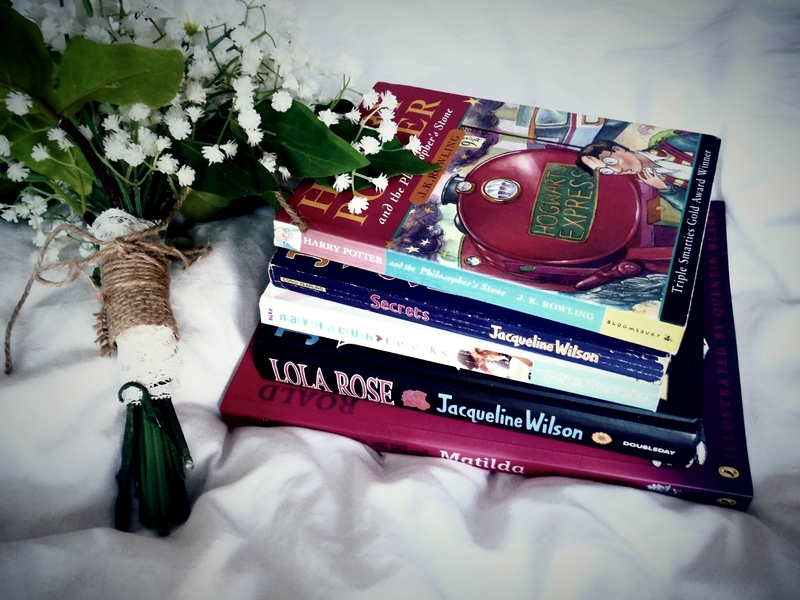 I looooove book related blog posts! I loved Roald Dahl as a child too! I think my favourite of his was The Giraffe, The Pelly, and Me. Although I have to say, some of my fondest memories of reading as a child come from anything written by Enid Blyton. Roald Dahl... his books were everything to me back then! My favourite was probably 'George's marvelous medicine'.